This is a 2 hour Methow At Home sponsored hike that is open to the public. Explore Spokane Gulch early Spring flowers. Meet at the Mazama Store after 10:30 to car pool to the trail head just across the still snow covered and skiable Mazama Meadow. Wear sturdy shoes suitable for walking over icy snow patches. This is Mazama's most popular trail and the path is already well beaten in, across the few snow patches. Spring beauties are out already. Everyday is Earth Day, but today let's get out and officially celebrate it with a hike that touches many of the Methow's different ecological communities including riparian, shrub-steppe and dry forest. This is a half day, moderate hike that will go to up the south side of Patterson Mtn to the top and loop around the north side back to the beginning. There are steep sections but we'll move at a naturalists' pace. Expect exceptional views, blooming flowers, tree and shrubs, and some birdsong too. Bring lunch, a drink, clothing appropriate for the day's weather, and any other optional stuff you might want like binoculars, field guides, camera, etc. Discover Pass required for the parking lot. Limited to 12 people, registration required. Join Rosalee & Xavier de la Foret on a tour of the Methow Valley Native Plant Garden at the Methow Valley Interpretive Center. This is less of a “hike” and more of a shuffle as we tour the garden to see the wide diversity of plants available there. This is a free event, donations to the MVIC are welcome. Register early to save your spot. Tour is from 11:00 to 12:30. Limited to 12. This is a half day hike. I will lead a car/walk up to Lake Cr and Andrews creek to view the Lewisia tweedyii. It has been renamed but many of us are reluctant to give up the poetic name. It blooms along the road, over the river and up Lake Creek . These locations make it easy to photograph. Bring the usual layers of clothes and snacks and cameras. This is an easy trip. Limited to 10. Join Rosalee & Xavier de la Foret for a wildflower walk where you will explore the many edible and medicinal plants found along the valley floor. With luck Lady’s Slippers will be in bloom! This is a very easy walk which will last about 1.5 hours. Bring water and snacks if desired. Register early to save your spot. Limited to 12. This is an annual treck to look for Eritricum nanum. Hike is strenuous. Will plan to camp near Hoodoo Pass. Dana will coordinate the trip logistics with those interested. Please contact Dana if interested. This is an all day hike. Hike starts at Tiffany Springs campground and heads to Honeymoon Pass and beyond. It is about 3 miles to the pass, probably muddy. You will need good hiking shoes, layers of clothes (this is Tiffany Mt, any weather can occur ay any time.) and lunch, water.This trip is snow melt dependent and if we hit it right the flowers can be wonderful. It is about an hour drive to the campground. Limit 10. Sweetgrass Butte is about 17 miles out of Winthrop up the Cub Creek drainage on mostly FS gravel roads. You can drive to the top of the Butte, but road conditions may not be ideal. At 6100’ the plants are starting to take on a bit of that subalpine and alpine feel. Once up to the Butte, the terrain is easy to moderate. Good hiking shoes/boots are recommended. Bring a lunch, bug repellant, sunscreen, water, and the basic back country attire for expected weather. We will return to the Barn around 3 pm. I will check on road and snow conditions just prior to the trip and let those signed up know what to expect. Limited to 10. This is an all day hike that will center around alpine lichens in the Hart's Pass area. You will be looking at a 2 to 3 mile hike in. Be prepared for Fall backcountry weather and bring enough food and water for the day. Terrain will be moderate to difficult, depending on how much scrambling you want to do. You will need sturdy hiking boots for scrambling around off trail. Trail pass is required for Hart's Pass. Don't forget your hand lens and lichen book, if you have one. Participants will be notified of the finalized trip logistics. Please contact Peter Neitlich. Anyone is welcome to join our free field trips. Please contact the trip leaders to register. Friday, March 20, Spring Equinox Birds & Flowers with Mary Kiesau. Mary is the Methow Conservancy’s Education Programs Director, and her hikes are sponsored by the Conservancy; by hey, they’re still hikes! On this date she will lead a birding walk from 8-9:30 AM and a flower walk from 4-6 PM. These relaxed walks (there are four more, March 26th and April 3rd, 10th and 22nd) are for all levels of experience, including beginners. Space is limited so registration is required. Email Mary or 509-996-2870. For information on the other four dates contact Mary or google Methow Conservancy March E-news. March 24- Golden Doe with Karen Edwards- The Golden Doe hike is a good early spring outing while the hills are green and the flowers are out. There are extensive stands of sage buttercups, plus long-flowered blue bells, shooting stars and yellow bells, if we’re lucky. It is approximately 3 miles round trip with possible loop option. Meet at the back of the community center parking lot in Twisp at 9:30 AM. Bring snacks or lunches, binocs and/or hand lenses. Maximum of 12 people. Contact trip leader Karen Edwards to join at 996-8211, email. April 12-13- The Ice Age Floods and Sun Lakes Flora with Dana Visalli- This is an overnight outing to Sun Lakes State Park, where we will walk on and off trail about 4 miles on both days (the footing is rough and uneven, but individuals can turn back at any time), enjoying spring flowers and practicing our keying. We will also study up on the Missoula Floods (also called the Spokane Floods and Bretz Floods) that roared through this area 13,000 years ago. We will probably camp at the park campground, when there will be more plant keying and folk music. Contact Dana to join, 509-997-9011, email. April 25-Patterson Mt with Therese Ohlson- This is an approximately 3 mile round-trip hike with 500’ of elevation gain. Therese is a professional botanist; she will have a species list of the plants on the hike for all participants. Meet at 10 AM and bring a lunch for an about 3-hour leisurely hike. Park at the boat launch area midway along Patterson Lake; you should have a Discover Pass for the parking lot, or you can hope to squeeze into the free area along the road. Reserve your spot with Therese Ohlson at 997-0118, email. May 7- Pearrygin Lake wetlands and shrub-steppe with Caryl Campbell. This outing is both for the unusual flowers that grow around the lake and for birds that frequent the area, including the possibility of seeing nesting long-eared owls. An easy 2 mile hike. Meet at the Methow trails (town trailhead) parking lot in Winthrop at 8:30 AM. Bring binoculars, ‘flower apps’ and food if desired; we will be done by noon. Sign up with Caryl at 996-3458 or email. June 5th at Big Valley with Rosalee de la Forêt. We’ll enjoy a leisurely stroll down the Dripping Springs/Big Valley trail, stopping often to look at the blooming spring flowers we find along the way. Rosalee will also share some medicinal and edible properties of both native and non-native plants. If we are lucky we’ll see some blooming stands of lady’s slippers, other wild orchids, violets and tiger lilies. Meet at the Dripping Springs parking lot/trailhead at 10am on June 5th. Plan on three hours. Bring snacks, if desired, and water. Contact trip leader, Rosalee, to join at 997-0545, email. June 13-Butterflies for Beginners- with Joyce Bergen. Plants too. Location to be announced, depending on seasonal conditions. Bring close-focus binoculars, nets, jars, and butterfly field guides if you have them; we have extras. No collecting, just catch-identify-and-release. Look for hike and meeting location confirmation via email a few days in advance of the trip. Meet at 9 a.m. Limited to 12 people. To join, notify Joyce Bergen, 509-996-7808, email. June 28- Hoodoo Pass- with Dana Visalli. This is a challenging 14-mile round trip hike to enjoy spring on the East Fork Buttermilk Creek trail and visit an alpine flower garden on a mountain ridge. There is steep snow to climb at Hoodoo Pass and then large talus blocks to clamber over on the way to the ridge beyond the pass. Contact trip leader Dana Visalli at 509-997-9011, email. July 1 (approximately, depending on how summer emerges)- Tiffany Lake, Honeymoon Pass and Middle Tiffany with Caryl Campbell. This is about a 5 mile hike up onto the tundra-like conditions on Middle Tiffany with great alpine flowers. Contact Caryl for this mountain adventure at 996-3458, email. July 12- Lone Fir Campground Forest Loop Trail- with Eric Burr. Meet on12th at 9 AM at the Mazama Store and we'll car pool from there. This is an easy 3 mile loop through middle elevation montane forest with unusual forest flowers, shrubs and mushrooms. Bring lunch as we'll be leisurely and eat out on the trail, weather permitting. Eric 509-996-3101. 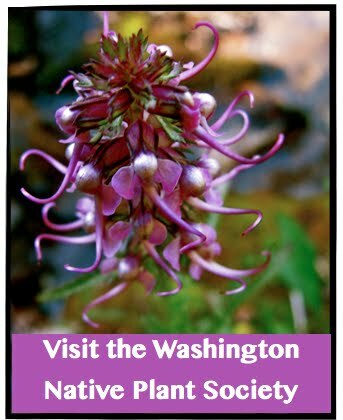 The Okanogan Chapter of the Washington Native Plant Society covers the area between Wenatchee and Republic, from the Cascade crest to the Columbia River. Each year we visit botanically interesting areas in order to appreciate, conserve and study our native plants and habitats. This is our 2014 calendar of hikes and events. All of these events are open to the public, but space is limited so registration is required. For more information call Dana at 509-997-9011 or George at 509-997-6010. Thursday, May 1. with Methow Conservancy. “After-Work” Wildflower Walk & Talk. Join a botany volunteer or Mary Kiesau, the Methow Conservancy’s Educational Programs Director, on a native plant “after-work” walk and talk. We'll go to a different location on each walk, appropriate for the time of the month. These mini-classes are free but space is limited so registration is required. Contact Mary for more details or to reserve your spot at mary@methowconservancy.org or 509-996-2870. Saturday, May 3. Golden Doe Wildlife Area, Native Plant Appreciation Week. Visit a large bench on land below towering McClure Mountain. The landscape is open, with scattered shrub-steppe, wetlands and forest stringers. Bring lunch, dress for the weather, and consider binoculars for the abundant wildlife. The hike involves moderate off-trail difficulty, but no steep slopes. Meet at 9am in the parking area behind Hank’s Market & Ace Hardware in Twisp. Prepare to carpool; cars parked on state land require Discover Passes. To join this field trip, notify G. Wooten (509-997-6010; george232@centurytel.net). Thursday, May 8. Judd Ranch. Former WDFW Methow Wildlife Area Manager, Tom McCoy, leads us in this little-visited area, at a time when wildflowers should be in their prime. The first steep mile leads up to a plateau of rolling hills with meadows. Bring lunch, dress for the weather, and wear boots appropriate for snake country. The hike involves moderate walking distances. Meet at 8am in the parking area behind Hank’s Market & Ace Hardware in Twisp. Prepare to carpool; cars parked on state land require Discover Passes. We need at least 5 people to take this trip, and no more than 12. To join this field trip, notify Joyce Bergen (509-996-7808; magpie@methownet.com). Saturday, May 17 (Saturday) Moccasin Lake Ranch Wildflower Walk and Picnic. Greata Beatty, author of Wildflowers of Moccasin Lake Ranch, will show us some of her best wildflower viewing spots. This event includes a picnic lunch and short walks accessed by vehicles. Funds will benefit the Methow Valley Interpretive Center, partners with the Native Plant Society through the native plant garden in Twisp. To register for this field trip, notify George Wooten (509-997-6010; george232@centurytel.net). Cost is $40. Sunday May 18. Gentle Homestead Walkabout. (Saturday June 14 & 15. Sinlahekin 75th Birthday. There will be hikes both days, all day, with experts on bees, lichens, mosses, molluscs, birds, kids, ungulates, and natural history. On Saturday, June 14, from 6 to 8pm, Dana Visalli presents: A Walk Through Time: The Evolution of the Sinlahekin's Rocks, Plants and Animals, an evening walk with a localized introduction to “Big History” and the connection between all things. On Sunday the 15th, from 9am to noon, Dana Visalli and George Wooten will lead a wildflower hike. Contact (509) 223-3358 or 509-892-7853 for more information. Saturday, June 21. Butterflies for Beginners. And plants too, possibly traveling to Lookout Mountain. Bring close-focus binoculars, nets, jars, and butterfly field guides if you have them. No collecting, just catch-identify-and-release. This hike is of moderate difficulty, but there are options to chase after butterflies. Destination could change, depending on conditions. Look for location confirmation a few days in advance of the trip. Meet at 9 a.m. at the Grange parking lot in Twisp. This trip is limited to 12 people. To join this field trip, notify Joyce Bergen (509-996-7808) magpie@methownet.com). Sunday, June 29 Hoodoo Pass Alpine Wildflower Extravaganza. Join us for an all day excursion into Midnight Mountain country on Sunday July 13th. The hike is moderately arduous following an unmaintained trail off the end of Little Bridge Creek Road. It is somewhere around 7 or 8 miles round trip with an elevation gain of about 3,000 feet. We are still looking for a few field trip leaders to help fill out the calendar. You don't need a lot of plant knowledge, just a willingness to coordinate a trip. Please contact Bergen Brell if you are interested: (509) 997-0625 or bergenbrell at yahoo.com. Sandra Strieby will lead an exploration of the DNR’s Methow Rapids Natural Area Preserve (NAP). Located near Pateros, the NAP features two rare types of native shrub-grassland that were once common: the antelope bitterbrush/bluebunch wheatgrass association and the smooth sumac/bluebunch wheatgrass association. It is also home to a variety of forbs, from ferns (Cystopteris fragilis) to cactus (Opuntia cf fragilis)—we’ll see what’s blooming when we get there. In particular, we will be looking for any plants that are not already on the DNR’s list for the area. When: We will meet at 9:00 in back of Hank’s (next to the apple orchard), and plan to return to Twisp by 2:00. Parking is very limited at the NAP, so we’ll aim to carpool in as few vehicles as possible. Trip rating: 3 (moderate). The terrain is gently sloping; walking is fairly easy, but there is no trail. The ground is strewn with granite boulders of various sizes. The site is fenced and getting in requires climbing over or through the fence. The NAP is a sensitive site, accessible only by permit. The field trip is limited to 12 people, including the leader. Please bring a lunch, water, sturdy footwear, all-weather clothing and sun protection. To join this field trip notify Sandra Strieby, (509) 997-2576 or sandra102 at centurytel.net. Reservations are strongly recommended as our permit allows only 12 people. Caryl Campbell will lead the trip up Patterson Mountain. The spring flowers should be in full force by then, but the bitter-root will probably not be blooming yet, but maybe. Bring binocs, we always notice birds too. Bring snacks and water and always carry rain gear. When: Meet at 9:00 am at the MVSTA town trailhead parking lot...or at Patterson Mt. parking area. Let Caryl know which lot you will be in. Trip rating: 3 (moderate). The trail is about 3 miles; we will spend about half a day, depending on how much botanizing we do. Limit is 12 people. To join this field trip notify Caryl Campbell (509)996-3458 or email: bearfight at methownet.com. Join Bergen Brell and Rosalee de la Forêt for a trip up and around the Aspen Lake area observing early spring wildflowers and medicinals to kick off Native Plant Appreciation Week! When: 9 a.m. at the back of the Community Center parking lot in Twisp, then car pool up to the Frost Rd. pull out just before the gate. To join this field trip notify Bergen Brell, (509) 997-0625 or bergenbrell at yahoo.com. Sunday, April 28th: Planting at the Methow Valley Interpretive Center’s Native Garden. Join Rob Crandall in planting natives after the Aspen Lake walk, before the Interpretive Center’s last-Sunday talk, or anytime in between. Please call Rob at (509) 341-4060 or visit http://www.okanogannativeplants.org/p/field-trips-2013.html for more information. Celebrate Washington’s Native Plant Appreciation Week (April 28–May 5) with a native plant “after-work” walk with the Methow Conservancy’s Educational Programs Director and naturalist, Mary Kiesau. When: 4-6 pm. Location to be announced depending on what’s blooming and where. To join this field trip notify Mary Kiesau, (509) 996-2870 or mary at methowconservancy.org. Join Eric Burr for one of the best, and most scenic, spring flower hikes. We follow a roughly marked, but easy foot path above the lower "rocks", actually cliffs, stopping frequently for flowers, gawking at the views, and photo ops. Broad grassy ledges gently climb to a high vantage point lunch stop about 500 feet vertically, and a mile from, the parking area. After lunch at least one hiker wants to follow the markers on over to Spokane Gulch and descend to Mazama that way. Consequently we'll arrange a car shuttle/car pool at the Mazama store before we start. Shoes with ankle support are preferred by most hikers for the ungraded and irregular foot path, and some also like the extra protection from the remote chance of encountering a rattle snake. Runners however love this trail to train for the Cutthroat Classic Race, and it's also been done in flip-flops. Delicious lunch stuff and liquids are handy at the store, but bring your own rain gear, if it looks possible on the appointed day. To join this field trip notify Eric Burr, burrski at methownet.com. Join Dana Visalli for a hike up the ridge that extends down to the south of Twisp from the hill with the cross on it. There are two species of rare and interesting plants on the gravel balds along the ridge, a lupine and a Cryptantha. Total distance will be about two miles; level of difficulty is easy except for the first half mile going uphill on a trail along the ridge. When: 9 a.m. at Hank’s Parking Lot; we won’t leave the cars there. We will be back by 12:00 noon. Trip rating: 1(easy) overall except for the first half mile going uphill on a trail along the ridge, which would be a 3 (moderate). To join this field trip notify Dana Visalli, (509) 997-9011or dana at methownet.com. George Wooten will lead an afternoon visit to the Twisp River fish rearing ponds at the west end of Twisp to study the plants and the pollinators. Bring snacks, water and rain gear. 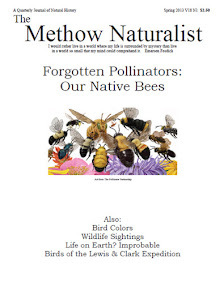 Optionally, at the end of the hike we can to head over to the Methow Valley Interpretive Center on the TwispWorks Campus and hear the Last Sunday Event featuring Bob Gillespie speaking on native bees beginning at 5 p.m. When: Meet at 1:00 pm at the Twisp Works. Trip rating: 1 (easy). The area has a small trail and footbridges. We will meander the paths along the river. Limit is 15 people. Please confirm your spot with George. To join this field trip notify George Wooten (509) 997-6010 or george232 at centurytel.net. Butterflying for beginners, and plants too, at a location to be announced, probably within the Methow Wildlife Area. Bring close-focus binoculars, nets, jars, and butterfly field guides if you have them, but extras will be on hand. No collecting, just catch-identify-and-release. Joyce will confirm the destination with participants in advance of the trip. When: 9 am at the MVSTA trailhead parking lot in Winthrop. This trip is limited to 12 people. Trip rating: 1 (easy)-3 (moderate). To join this field trip, notify Joyce Bergen, (509) 996-7808 or magpie at methownet.com. Monday, July 8th: Tiffany Springs Camp Ground to Honeymoon Pass. Date may change if the snow hasn't melted out and/or there are no flowers yet. Caryl Campbell will lead us through wonderful fields of flowers on the way to Tiffany Lake including the yellow columbine. .Up by the pass we may see the pygmy Lewisia, and if we do climb up to Middle Tiffany we will look for purple saxifrage. When: Meet at 8 am at the MVSTA town trailhead. Trip rating: 3-4 (moderate to somewhat difficult), about 4-5 miles round trip, but we will be at an altitude of above 7000 ft. We might go further up towards Middle Tiffany in which case the hike is cross country and steeper. *It probably will be wet, so boots are needed. Always bring a rain coat when you go to Tiffany; it could also get cold. This will be an all day trip, so bring lunch. Binocs if you want. To join this field trip notify Caryl Campbell, (509) 996-3458 or bearfight at methownet.com. Join Mary Kiesau for a short hike through a bit of forest, then open up to a wide south-facing slope covered in multiple avalanche paths that are full of subalpine flowers. From here, we make a relatively easy traverse across to the back (south) side of Blue Peak. The north side of Stiletto will face us the entire way and we are surrounded by peaks and a huge glaciated valley. Time permitting, we'll climb the short, steep approach to Copper Pass which looks down into the Twisp drainage. When: 8 a.m. at the Mazama Corral Parking lot. Limited to 12 people, no dogs. Join Kathleen Learned for a trip up Burch Mountain. Tentatively scheduled for July 14th. When: July 14th, contact Kathleen for more information. To join this field trip notify Kathleen Learned, (206) 323-3974 or klearned at seanet.com.